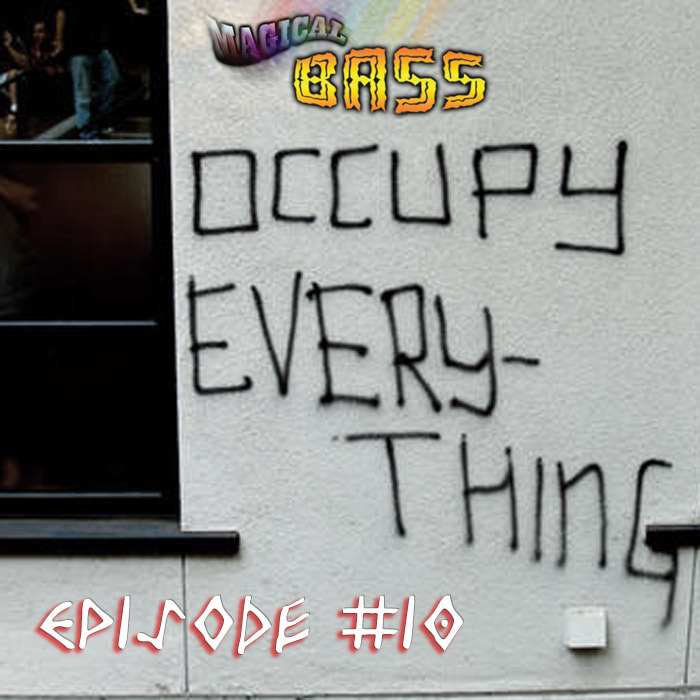 Magical Bass smacks us with a powerful episode, dedicated to the Occupy movement. 01. Corvus Corax "Miser (DJ 0.000001 Remix)"
02. sole "Dumb This Down (DJ 0.000001 Remix)"
03. Saul Williams "Penny For A Thought"
04. Mike Ladd "Awful Raw"
05. Bleubird "A Millie Joel"
06. Dead Prez "Malcolm Garvey Huey"
07. Big Juss "Illustrations Of Hieronymous Bosch (DJ 0.000001 Remix)"
08. dDamage ft. Big Juss "Verdi Rough"
09. Nephilim Modulation Systems "Brave New World (DJ 0.000001 Remix)"
12. The Bug ft. Wayne Lonesome "Buckleup"
13. Asian Dub Foundation "Witness (DJ Scud Remix)"
14. Th' Mole "We Control Everything (DJ 0.000001 Remix)"
15. Karyzma "Work (DJ 0.000001 Remix)"
16. Ed Cox "Attack Of The Werewolf Clowns"
17. Bucovina Club Vs. Taraf De Haiduks "Carolina (DJ 0.000001 Remix)"
18. Infernal Noise Brigade "Nanafushi (Live)"
19. Byrds "Turn Turn Turn (DJ 1 Billionth Remix)"
20. Street Sweepers Social Club "Promenade (DJ 0.000001 Remix)"
21. Rage Against The Machine "Killing In The Name (Th' Mole Remix)"
22. Drumcorps "Down (DJ 0.000001 Remix)"
23. DJ Scud "V.I.P. Pressure Pt. 1"
25. Fischerspooner "Infidels Of The World Unite (Th' Mole Remix)"
26. DJ 0.000001 "What The F* Do I Think I'm Doing? (We All Fall Down Version)"